Rangoon's No 1 emporium: Rowe & Co, across the way from the Sule Pagoda. A store for the discerning expatriate, Rowe & Co was known as the Harrods of the East, and sold an impressive array of "ladies' & gentlemen's outfitting, drapery, millinery, boots and shoes, crockery and glassware, brassware, trunks, cutlery, watches and clocks and saddlery". 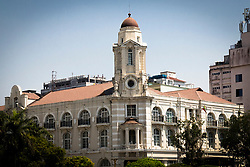 More recently, the imposing building with the splendid central tower was home to the Myanmar government's immigration department, where squadrons of officials manned the desks, shuffled the paperwork and maintained black lists of undesirables (many foreign journalists among them). In 2005, the immigration department, like most Myanmar government departments, was moved to Myanmar's new capital in Naypyidaw, 320km north of Yangon.